In the spring of 1889, Van Gogh wrote his brother Theo describing the process in which he painted this wild olive grove and the bright midday sun. 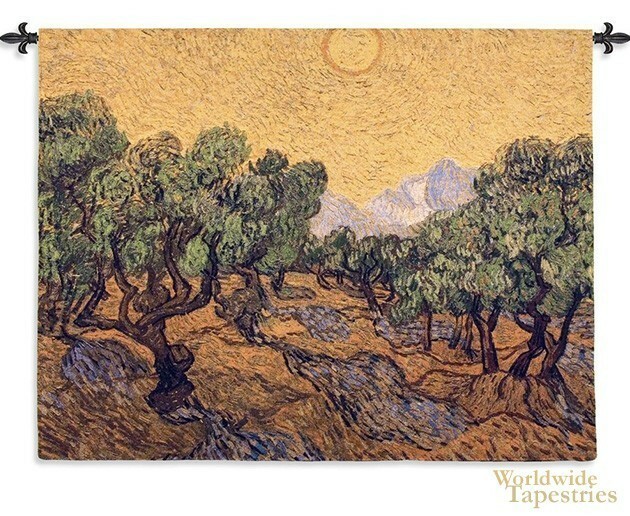 Here in Olive Trees tapestry we see the van Gogh trademarks at this period of his artistic life where he uses his unique approach to capture light and color. These are principles which he shared with painter Gauguin, where the effect of art through their technique was more important than striving for realism. He made two versions of the olive trees, one at night and this one in the sun. This tapestry is backed with a lining and has a tunnel for easy hanging. Note: tapestry rod and tassels, where pictured, are not included in the price.